Deborah Sharp, Author of the Mace Bauer Mystery Series is returning to NBC's Today Show! Tune in Wednesday morning, Dec. 28, sometime after 8:30. She said, "See if you can tell how terrified I am to talk live on national TV about Mama Sees Stars." Click HERE to watch her first interview, way back in 2008. Here's a word from Mama... she does love to have her say... "
Well, tie me to a pig and roll me in the mud! Ms. Fancy Pants Author Deborah Sharp can be gracious about granting me some space before she takes over this posting on Lou's blog. After all, she's the one headed back to New York City and the Today Show. Mark my words: Her head is bound to swell like Sal's big toe when he stubbed it on the concrete creche at Himmarshee's Holiday Festival of Winter Lights and Holy Christmas Celebration. I hope she sees fit to mention during her TV interview that MAMA SEES STARS is her fourth funny, Southern-flavored mystery that's all about me. If you haven't read STARS yet, you can click on an excerpt on the Wide World of the Web, right here. 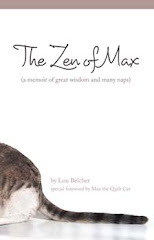 Of course, all my stories are available as books, and what they call downloads for those eeee-readers, too. They make mighty fine gifts. Too late for the holidays? Call it a New Year's present. Hello, Ms. Fancy Pants Author here. 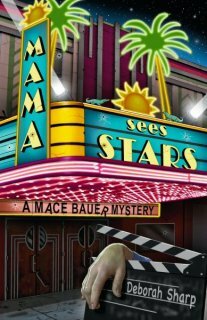 I've been having fun with red-carpet book signings, playing off the Hollywood-themed mystery of MAMA SEES STARS. When a big-time movie company comes to little Himmarshee, Mama gets her close-up .... with murder! I'm so grateful to those of you who've come out to see me. I love to meet new readers, too. Check out my website Events page to see if I'm visiting near you. Among other appearances, I'll do a workshop on dialogue, Feb. 4 at Murder on the Beach, Florida's fab mystery bookstore. Sleuthfest, March 1-4 in the Orlando area; and Malice Domestic, April 27-29, outside Washington, D.C. If you come to a signing, do glam it up, movie-star style. My red carpet may be tiny, but we still dress BIG.